Ghostface Killah was on deck to charm and chisel away at some of the world’s most pertinent issues in the latest installment of Pitchfork’s Over/Under series. Jan 07, 2015 · The one and only, Ghostface Killah, is back! Today the wordsmith is back with a dope new video, chopping it up with a game of 'Over/Under'. Check it out! 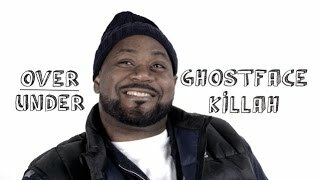 Jan 07, 2015 · Ghostface Killah sits down with Pitchfork for their Over / Under Series . Repeat Ghostface Killah - Over/Under ... Choose your time range using the slider.